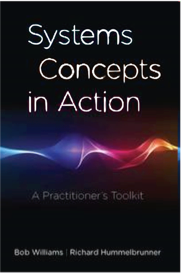 The book Systems Concepts In Action : A Practitioner's Toolkit by Richard Hummelbrunner and Bob Williams is focused on the practical use of systems ideas. It describes 19 commonly used systems approaches, complete with case studies, variations and discussion of each approach's pros and cons. Each chapter begins with a set of questions that the particular method addresses. You can find it on Amazon, or get it direction in various formats from Stanford University.